You can develop mobile or Desktop MobileFirst web applications by using your preferred development environment and tools. ibmmfpf.js - The core of the SDK. ibmmfpfanalytics.js - Provides support for MobileFirst Analytics. See the supported web browsers prerequisite for setting up the web development environment. To run NPM commands, you must install Node.js. To add the SDK to new or existing web applications, first download it to your workstation and then add it to your web application. From a command-line window, navigate to your web application’s root folder. Run the command: npm install ibm-mfp-web-sdk. To add the Mobile Foundation Web SDK, reference it in a standard fashion in the web application. The SDK also supports AMD, so that you can use Module Loaders such as RequireJS to load the SDK. Reference the ibmmfpf.js file in the HEAD element. 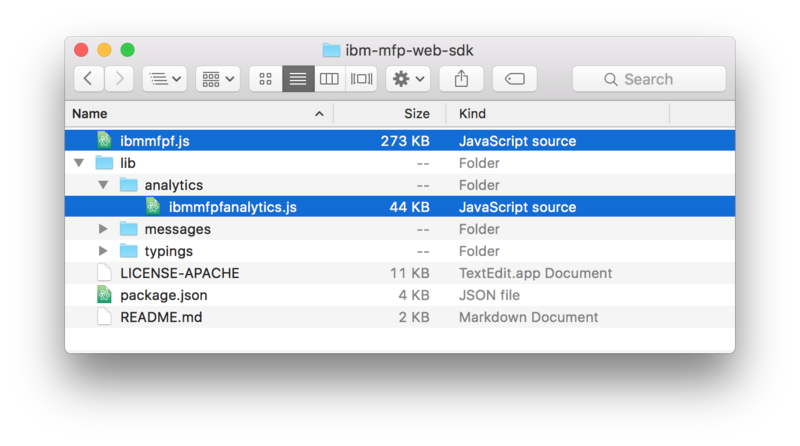 Important: If adding Analytics support, place the ibmmfpfanalytics.js file reference before the ibmmfpf.js file reference. applicationId : 'com.sample.mywebapp' // Replace with your own value. sessionMode : true //This is an optional paramter. Setting this to true ensures that MFP related data is stored in the session rather than in the local storage. If this option is set to false or not set at all, default is local storage. mfpContextRoot: The context root used by the MobileFirst Server. applicationId: The application package name, as defined when you register the application. You can register applications either from the MobileFirst Operations Console or from the MobileFirst CLI. Open your favorite browser and load the MobileFirst Operations Console by entering the http://localhost:9080/mfpconsole/ URL. Click the New button next to Applications to create a new application. Select Web as the platform, and provide a name and identifier. From a command-line window, navigate to the root folder of the web application and run the command: mfpdev app register. SDK releases can be found in the SDK NPM repository. Navigate to the root folder of the web application. Run the command: npm update ibm-mfp-web-sdk. If web resources are hosted on a different server machine than the one that MobileFirst Server is installed on, a same-origin policy violation is triggered. The same-origin-policy security model is designed to protect against potential security threats from unverified sources. According to this policy, a browser allows web resources (such as scripts) to interact only with resources that stem from the same origin (which is defined as a combination of URI scheme, host name, and port number). For more information about the same-origin policy, see The Web Origin Concept specification, and specifically 3. Principles of the Same-Origin Policy. Web apps that use the MobileFirst web SDK must be handled in a supporting topology. For example, use a reverse proxy to internally redirect requests to the appropriate server while maintaining the same single origin. Serving the web application resources, for example, from the same WebSphere Application Server Liberty profile application server that is used in the IBM MobileFirst Foundation Developer Kit. Using Node.js as a reverse proxy to redirect application requests to the MobileFirst Server. When you use Chrome during development, the browser might not allow an application to load if it uses both HTTP and a host that is not localhost. The cause is the secure-origins policy that is implemented and used by default in this browser. Replace “test-to-new-user-profile/myprofile” with the location of a folder that will act as a new Chrome user profile for the flag to work. Read more about Secure Origins in this Chormium developer document.